And broke a front bone in my back. I ate it and gave it her back. And that’s why I never came back. And took a front seat at the back. I cannot see over your hat. And broke my front bone at the back. Comments: These are two versions of a popular children’s nonsense rhyme, documented during the 1950s in Kirkaldy (in Scotland) and Enfield (in London) by the folklorists Iona and Peter Opie for their classic compilation The Lore and Language of Schoolchildren. They note that they had found versions of this rhyme at ten schools in the United Kingdom. They suggest that the rhyme could be quite old and may originally have referred to the theatre rather than the cinema. 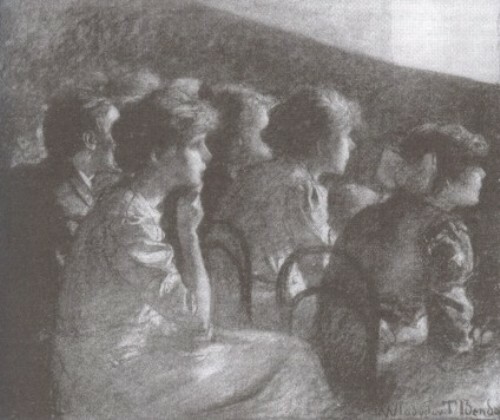 The mention of hats obscuring the view of the audience (even if worn by people behind them) echoes a common complaint of pre-First World War film audiences, which could be further evidence of the rhyme’s long-running popularity among children. This entry was posted in 1950s, Poetry and rhyme, United Kingdom and tagged Children, Cinemas, Kirkcaldy, London, Theatres. Bookmark the permalink. And it landed me one in the eye. Fantastic version – makes me think of Bunuel and Dali’s Un Chien Andalou (with its dead donkeys). I couldn’t see over her hat. Very good, thank you. I like the ‘Next Friday’ variation on the theme. All further suggestions welcome. I like those last two lines. There must be as many variants of this as there were playgrounds in the UK forty years ago. I wonder when the rhyme died out (apart from in the memories of those who chanted it when young). I reckon these things died out when ‘elf ‘n safety came in and stopped kids running round playgrounds! I don’t think playground rhymes have died out at all, but this particular one will have done so because ‘going to the pictures’ is no longer a regular part of children’s lives. Unless someone knows better? Very good, thank you. More contributions most welcome. I took a front seat at the back. I ate it then took it back. I saw a dead donkey a’dying. I hit him in the eye and I missed him. I love that last line that fails to rhyme. I learned this about 50yrs ago. I think my father taught it to me but he didn’t remember. I love the line “The tickets were free if you paid at the door”. Sums up life, really. I went to the pictures tomorrow, I had a front seat at the back. They gave me plain cake with currents in, I ate it and gave it them back. I went down a straight crooked lane, saw a dead donkey dying, I picked up a stone I couldn’t lift and sent it flying. Just what is it about the dead donkey in many of these variations on the rhyme? It turns the absurd into the surreal. These nonsense tropes were clearly interchangeable. But I suspect that these rhymes, although found by Iona and Peter, were not passed from child to child, but down the generations. Especially grandparent to grandchildren as I now try to pass on the old tricks and riddles to my grandchildren. It’s interesting how many of those who have added comments here have noted that they learned the rhymes from a parent or grandparent. In The Lore and Language of Schoolchildren the Opies stress that such rhymes are handed on from child to child “beyond the influence of the family circle”. Maybe things are never so simple. I don’t think that things are simply told from child to child! I remember a TEACHER over 65 years ago when I was about 8 telling the story or a man who go out of prison by rubbing his hands together till they were sore. He took the saw and cut his bed into two halves. Two halves make a whole. So he climbed through the hole and escaped. Then he shouted until he was hoarse. He jumped on the horse and went home. A bee flew by and went “Buzz, buzz”. He jumped on the bus and went home. No things aren’t just passed from child to child. The version my mum taught me was one she heard during the 2nd World War in Chester – ‘I went to the pictures tomorrow, I bought a front seat at the back, a lady gave me a banana, I ate it and gave it her back’. Mum had never had a banana and wasn’t quite sure what it was! ‘I went to the pictures tomorrow. I took a front seat at the back. I fell from the pit to the gallery, and hurt a front bone in my back. A woman she gave me a biscuit – I ate it and gave her it back. He’d say the last 2 lines a lot quicker, but I never got over the eating of the biscuit and giving it back. I thought it was thwe funniest thing a 7 year old could ever hear! And hit the front of my back. I ate it and gave it them back. And saw a dead donkey alive. On a similar note from over 60 years ago via my grandparents…. The snow was raining heavily, although the streets were dry. When a submarine came above and dropped a bomb on me! The fender picked the poker up and charged the frying pan. And that’s all I can tell you cause I don’t know any more! I went to the pictures tomorra, had a front seat at the back a lady gave me a tomata I ate it and gave her it back .